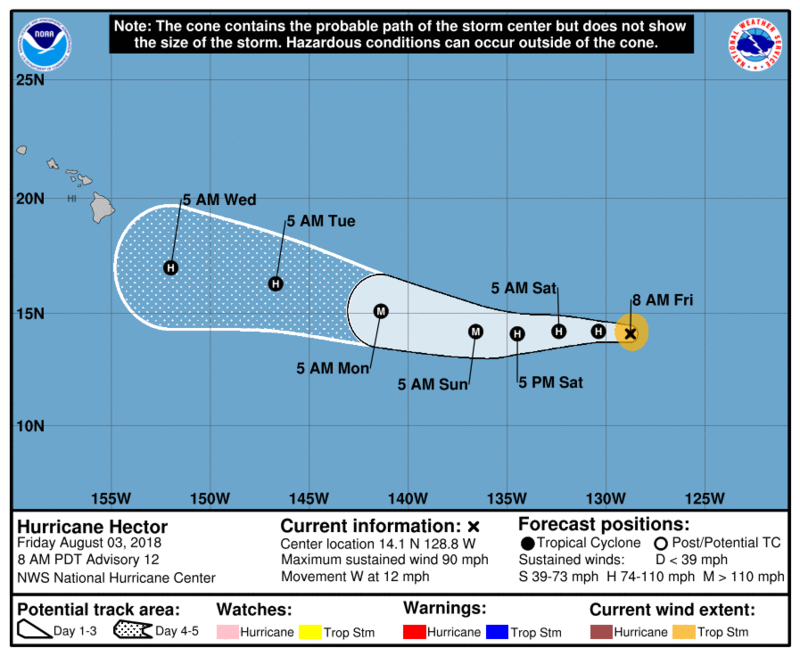 The Central Pacific Hurricane Center forecasts that Hector will continue to travel toward the WNW at an increased forward speed through Tuesday, followed by a westward motion Tuesday night through Friday. The storm was moving west-northwest at roughly 16 miles per hour. Hurricane Hector regained strength in the eastern Pacific late on Sunday and swelled into a Category 4 storm again with sustained 140 miles per hour winds as it stayed on target to possibly hit Hawaii by midweek, officials said. The center of the Category 4 storm was about 735 miles east-southeast of Hilo and 945 east-southeast of Honolulu, the CPHC said in its 5 p.m. HST update. Hawaii faces a new threat in the form of Hurricane Hector, a Category 3 storm that is churning its way towards the Big Island. After that, gradual weakening is expected Monday night through Wednesday. "While the official forecast track continues to lie south of the Hawaiian Islands, it is too soon to determine what kind of impacts might occur in the state, since track errors can be large at long time ranges", the NHC said.